Before the year 2014, there were many people using Google, Facebook, and Amazon. Today, there are still many people using services from those three tech giants (respectively, GOOG, FB, AMZN). Not much has changed, and quite literally the user interface and features on those sites has remained mostly untouched. However, the underlying dynamics of power on the Web have drastically changed, and those three companies are at the center of a fundamental transformation of the Web — which will end with bypassing it completely. What has changed over the last four years is market share of traffic on the Web. It looks like nothing has changed, but GOOG and FB now have direct influence over 70 percent of internet traffic. Mobile internet traffic is now the majority of traffic worldwide and in Latin America alone, GOOG and FB services have had 60 percent of mobile traffic in 2015, growing to 70 percent by the end of 2016. The remaining 30 percent of traffic is shared among all other mobile apps and websites. Mobile devices are primarily used for accessing GOOG and FB networks. Another demonstration of GOOG and FB dominance can be seen among media websites. The most popular web properties that don’t belong to GOOG nor FB are usually from the press. For instance, in the USA there are six media sites in the top 10 websites; in Brazil there are also six media sites in the top 10; and in the UK it’s five out of 10. From where do media sites get their traffic? Prior to 2014, Search Engine Optimization (SEO) was a common practice among Web Developers to improve their site for Google searches, since it accounted for approximately 35 percent of traffic, while more than 50 percent of traffic came from various other places on the Web. Back in 2014 SEO was important, while Facebook presence was ‘nice-to-have’. Over the next three years, traffic from Facebook grew to be approximately 45 percent, surpassing the status that Search traffic had. In 2017, the media is utterly dependent on both Google and Facebook for page views, since it’s the channels for the majority of their traffic. The relationship between media sites and the two tech giants is difficult. In 2014, FB built Facebook Paper as an attempt to have a larger control over news consumption. Their tactic failed, but their strategy persisted through different means such as Facebook Instant Articles. The media, being dependent on social traffic and threatened by the social behemoth, reacted and they pulled out support for Instant Articles. Meanwhile, GOOG noticed how its Search traffic hadn’t improved, while Facebook had picked up steam, so GOOG launched their own Instant Articles alternative called Accelerated Mobile Pages (AMP) and proactively started serving articles from GOOG servers instead of directing traffic to media sites. The press reacted similarly to how they did for FB. They reported bold stories about the Search behemoth’s thirst for control over news consumption trying to keep their reach at bay. Data shows FB has dramatically improved its dominance on the Web, while Google Search hasn’t significantly changed. How exactly did FB achieve that, and what events were key to that development? Prior to 2014, both companies had a portfolio of multiple web services. GOOG hadn’t yet become Alphabet, so it’s focus was diffused. GOOG was trying to enter the social market, first with Google Wave, then Google Buzz, Orkut, and Google+. In total, GOOG has acquired 18 companies from the social media category, of which only one acquisition happened post-2014, while five of those happened in 2010 alone. FB was competing in the search market, through Bing, in partnership with MSFT. During 2014, FB apparently reorganized itself to focus on social only. In February, it bought WhatsApp, for 11 times the price GOOG bought YouTube. In December, it canceled its Bing partnership with MSFT. User retention on Facebook.com grew steadily (see chart below). Through its four simple products, Facebook, WhatsApp, Messenger, and Instagram, FB had become the social superpower. Similarly, GOOG in 2014 started reorganizing itself to focus on artificial intelligence only. In January 2014, GOOG bought DeepMind, and in September they shutdown Orkut — one of their few social products which had momentary success in some countries — forever. GOOG is currently lagging behind FB in terms of how fast it is growing its dominance of the web, but due to their technical expertise, vast budget, influence, and vision, in the long run its AI assets will play a massive role on the internet. They know what they are doing. These are no longer the same companies that we knew four years ago. GOOG is not an internet company anymore, it’s the knowledge internet company. And FB is also not just an internet company anymore, it’s the social internet company. The two giants used to compete, or at least tried, and this competition kept the internet market diverse. Today, however, they seem to be satisfied with their orthogonal dominance of parts of the Web, and we are losing diversity of choices. Which leads us to another part of the internet: e-commerce and AMZN. It might sound weird but AMZN isn’t focusing on making a profit. Instead, its main mission is to seek market leadership, crushing its competitors in the US. I could elaborate more on how AMZN is the e-commerce company, but you probably have a pretty clear idea about how that would go. I would also just be repeating Scott Galloway’s great take on this topic. It’s really worth watching his talks if you’re interesting in knowing more about it. The events and data above describe how three internet companies have acquired massive influence on the Web, but why does that imply the beginning of the Web’s death? To answer that, we need to reflect on what the Web is. The original vision for the Web according to its creator, Tim Berners-Lee, was a space with multilateral publishing and consumption of information. It was a peer-to-peer vision with no dependency on a single party. Tim himself claims that the Web is dying. The Web he wanted and the Web he got are no longer the same. However, some might ask, doesn’t GOOG defend the open Web? GOOG, as a company born from the Web, has helped take it forward both technologically and in adoption — that’s undeniable. They still lead efforts to improve the open Web, such as advocacy of Progressive Web Apps (PWAs) over native mobile apps. Isn’t GOOG trying to guarantee the open Web stays alive? Not necessarily. GOOG’s goal is to gather as much rich data as possible, and build AI. Their mission is to have an AI provide timely and personalized information to us, not specifically to have websites provide information. Any GOOG concerted efforts are aligned to the AI mission. Mobile usage is on the rise — having already crossed desktop as the primary channel for internet usage — and native mobile apps are so far the best way of providing good user experience on mobile. GOOG collects little or no data from native mobile apps, to some extent on Android, but specially on iOS. PWAs happen to live in the neutral and open Web, and are better suited for data collection while providing great user experience on mobile. GOOG promotes lock-in and proprietary technologies such as Firebase and Google-dependent AMP installations as much as it advocates open PWAs. GOOG does not consistently defend the open Web. They dropped XMPP in Gtalk, and Gtalk itself was deprecated, favoring Google Hangouts with a proprietary protocol. Chrome Web Store is a walled garden like App Store. They shut down Google Reader based on RSS, an open standard. Google Cloud TPU is proprietary hardware that only exists in their datacenters, supporting their open source framework TensorFlow. Google Inbox suffers “proprietary creep”: non-standard, closed algorithms that promise to organize your life, an essential component of a lock-in based business model. GOOG is a huge company where employees have autonomy and multiple projects and efforts are occurring. Big efforts, though, are coherent, concerted, and well aligned with its mission: to be an AI-first company, an AI that is closed and lives in their cloud. From the 90s until the 2010s, the Web we have experienced has been, albeit somewhat imperfectly, faithful to its original purpose. The Web’s diversity has granted space for multiple businesses to innovate and thrive, independent hobbyist communities to grow, and personal sites to be hosted on whatever physical servers can host them. The internet’s infrastructural diversity is directly tied to the success of diverse Web businesses and communities. The Web’s openness is vital for its security, accessibility, innovation, and competitiveness. After 2014, we started losing the benefits of the internet’s infrastructural and economical diversity. It’s difficult to compete with AMZN’s and GOOG’s Cloud Services, which host a massive amount of sites for other businesses. Any website aspiring for significant traffic depends on Search and Social traffic. 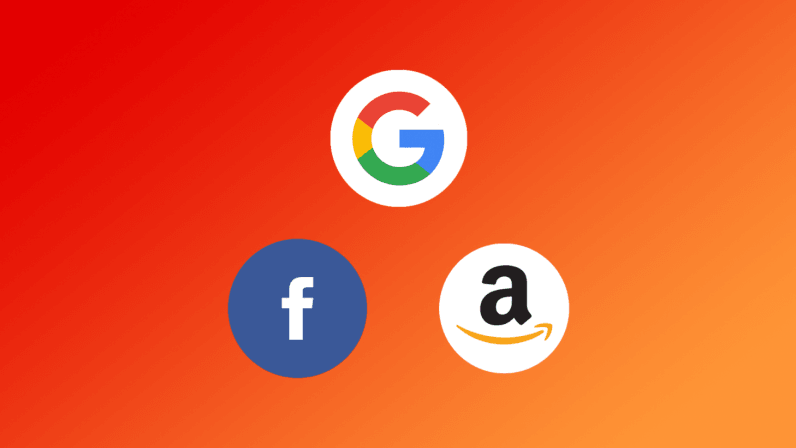 The following analysis is an extrapolation for the future, based on the current state of the Web and strategies made public by executives at GOOG-FB-AMZN. The War for Net Neutrality in the US won a battle in 2014, but in 2017 we are seeing a second battle which is more likely to be lost. Internet Service Providers (ISPs) are probably soon going to dictate what traffic can or cannot arrive at people’s end devices. GOOG-FB-AMZN traffic would be the most common, due to their popularity among internet users. Because of this market demand, ISPs will likely provide cheap plans with access to GOOG-FB-AMZN, while offering more expensive plans with full internet access — and it’s already a reality in countries like Portugal. This would expand even more the dominance the three tech giants already enjoy. There would be no more economical incentive for smaller businesses to have independent websites, and a gradual migration towards Facebook Pages would make more sense. Smaller e-commerce sites would be bought by AMZN or go bankrupt. Because most internet users couldn’t open all the sites, GOOG would have little incentive to be a mere bridge between people and sites. GOOG’s shift away from Search is a sign how they are growing their strategy beyond the Web. For many years, Google used to be just a tool that played the important role of assisting the Web, by indexing it. Lately, however, it is not attractive for Google to be a mere search engine of the Web. For the purposes expressed in their mission statement, “to organize the world’s information and make it universally accessible and useful”, the search engine approach has been exhausted. The multi-second path from search query, to search results, to webpage, to information, is too long to provide an ideal user experience. Their goal is to cut the middlemen in that path. They have tried to cut out the results page with their “I’m feeling lucky” button, but without intelligent analysis they cannot reliably take shortcuts in that path. With AI, they believe they can shorten the path to just one step, “get information,” even without searching for it in the first place. That’s the purpose of Suggest. As an index, people have different expectations on search result neutrality. Some want Google Search to be entirely neutral, some demand immediate action to remove some results. The European Union has both [demanded GOOG to comply with removal requests, and [fined GOOG for not being neutral in shopping queries. It’s not beneficial for GOOG to assume the role of an impartial arbiter of content, since it’s not supporting their business model. Quite the contrary, they are under public scrutiny from multiple governments, potentially risking their reputation. The Suggest strategy is being currently deployed through Google Now, Google Assistant, Android notifications, and Google Home. None of these mentioned technologies are part of Web, in other words, not part of “browser-land” made of websites. The internet is just the underlying transport layer for data from their cloud to end-user devices, but the Web itself is being bypassed. Eric Schmidt’s vision for the future is one where internet services are ubiquitous and personalized, as opposed to an experience contained in web browsers in desktop machines. Similarly, while AMZN’s business still relies on traffic to their desktop web portal (accounting for 33 percent of sales), a large portion (about 25 percent) of their sales happen through mobile apps, not to mention Amazon Echo. Like Google Home, Amazon Echo bypasses the Web and uses the internet just for communication between cloud and end user. In these new non-web contexts, tech giants have more authority over data traffic. They can even directly block each other, like GOOG recently cut support for YouTube traffic in Amazon Echo devices. GOOG, FB, AMZN, and Microsoft are mimicking Apple’s (AAPL) strategy of building brand loyalty around high-end devices. Through a process I call “Appleification”, they are (1) setting up walled gardens, (2) becoming hardware companies, and (3) marketing the design while designing for the market. It’s a threat to AAPL itself, because they are behind the other giants when it comes to big data collection and its uses. While AAPL’s early and bold introduction of an App Store shook the Web as the dominant software distribution platform, it wasn’t enough to replace it. The next wave of walled gardens might look different: less noticeable, but nonetheless disruptive to the Web. There is a tendency at GOOG-FB-AMZN to bypass the Web which is motivated by user experience and efficient communication, not by an agenda to avoid browsers. In the knowledge internet and the commerce internet, being efficient to provide what users want is the goal. In the social internet, the goal is to provide an efficient channel for communication between people. This explains FB’s 10-year strategy with Augmented Reality (AR) and Virtual Reality (VR) as the next medium for social interactions through the internet. This strategy would also bypass the Web, proving how more natural social AR would be than social real-time texting in browsers. Already today, most people on the internet communicate with other people via a mobile app, not via a browser. You can still buy a Walkman and listen to a tape with it, but the technology has nevertheless lost its collective relevance. The Web’s death will come as a gradual decay of its necessity, not as a dramatic loss. The internet will survive longer than the Web will. GOOG-FB-AMZN will still depend on submarine internet cables (the “Backbone“), because it’s a technical success. That said, many aspects of the internet will lose their relevance, and the underlying infrastructure could be optimized only for GOOG traffic, FB traffic, and AMZN traffic. It wouldn’t conceptually be anymore a “network of networks”, but just a “network of three networks”, the Trinet, if you will. The concept of workplace network which gave birth to the internet infrastructure would migrate to a more abstract level: Facebook Groups, Google Hangouts, G Suite, and other competing services which can be acquired by a tech giant. Workplace networks are already today emulated in software as a service, not as traditional Local Area Networks. To improve user experience, the Trinet would be a technical evolution of the internet. These efforts are already happening today, at GOOG. In the long-term, supporting routing for the old internet and the old Web would be an overhead, so it could be beneficial to cut support for the diverse internet on the protocol and hardware level. Access to the old internet could be emulated on GOOG’s cloud accessed through the Trinet, much like how Windows 95 can be today emulated in your browser. ISPs would recognize the obsolescence of the internet and support the Trinet only, driven by market demand for optimal user experience from GOOG-FB-AMZN. Perhaps a future with great user experience in AR, VR, hands-free commerce, and knowledge sharing could evoke an optimistic perspective for what these tech giants are building. But 25 years of the Web has gotten us used to foundational freedoms that we take for granted. We forget how useful it has been to remain anonymous and control what we share, or how easy it was to start an internet startup with its own independent servers operating with the same rights GOOG servers have. On the Trinet, if you are permanently banned from GOOG or FB, you would have no alternative. You could even be restricted from creating a new account. As private businesses, GOOG, FB, and AMZN don’t need to guarantee you access to their networks. You do not have a legal right to an account in their servers, and as societies we aren’t demanding for these rights as vehemently as we could, to counter the strategies that tech giants are putting forward. The Web and the internet have represented freedom — an efficient and unsupervised exchange of information between people of all nations. In the Trinet, we will have even more vivid exchange of information between people, but we will sacrifice freedom. Many of us will wake up to the tragedy of this tradeoff only once it is reality.